You have to wonder, just a little, about Maryland in the 1730s. The Legal Genealogist certainly did, last night, while poking around in early statutes in anticipation of this weekend’s Fall Seminar of the Maryland Genealogical Society. Because you can’t help but wonder what the backstory must have been when you read some of the early laws of places like Maryland. Think about what Maryland must have been like in the 1730s. An underpopulated, agrarian colony less than 100 years old, then, as of 1732. So… what were the very first topics of legislation “at a session of Assembly, begun and held at the City of Annapolis, on Tuesday, the Eleventh Day of July, in the Eighteenth Year of the Dominion of the Right Honorable Charles, Lord Baron of Baltemore,”6 in 1732? But the reasoning behind the election fraud statute wasn’t set out in the law, so we have to kind of read between the lines. Doesn’t that make you wonder just what was going on in Maryland in 1732? Even more so when you find that the act never became law? Grazing beasties and election fraud. 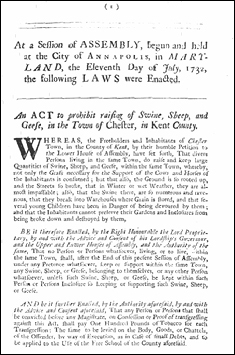 I always get a kick out of the 1732 law prohibiting the keeping of certain animals in Chestertown. Although I doubt we still have any sheep in Chestertown and the only swine may be a perhaps surreptitiously kept pet pig, geese rule here. We have wild Canada geese in large numbers that migrate here for the winter, with some liking it so well that they stay here year-round and are thus dubbed”residential” or “resident” geese—so watch your step in the in-town areas they tend to frequent. We have also have had domestic geese that have become wild, with Lucy the best known. 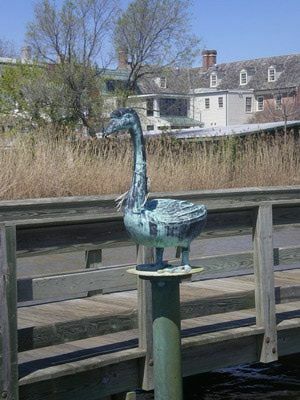 Sometimes rather feisty, she reigned (until she died in 2006, supposedly at about age 14) at her spot at the foot of Cannon St., near the river-walk bridge below the Washington College president’s house’s river-front garden. The mayor presided at her well-attended funeral there and delivered the eulogy. Thereafter, Lucy’s local fans raised money for a bronze statue/sculpture in her memory,a book for children was written about her, a brief YouTube has been visited over 1200 times,various items in her memory are sold in some downtown shops, and a NY Times article mentions her. Only in Chestertown!